This first installment is designed to give you, my new audience members, a feel for who I am and how I improved my financial life for the better. The goal of this installment was to lay a basic foundation that I will build upon next week so that you start to feel like you know me a little better. I used an analogy to help explain where I was financially back in 2004-2005 before I decided to take more control over my finances. This installment uses that analogy to help you see how taking control of your finances can lead to a better life where emergencies provide less harm to you than they potentially could. Sit back and enjoy this short installment of Thriving Financially with Dr. Thrift. Please leave comments on what you liked and how you think the show can be improved. Please also like Dr. Thrift on Facebook and follow me on Twitter. Both links can be found on the drthrift.com homepage. 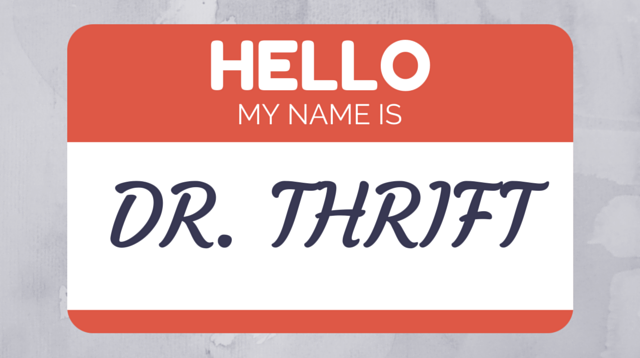 Do you have a question or comment you would like addressed on a few show, email me at drthrift@drthrift.com. Please keep in mind this first episode wasn’t designed to give advice but rather to help you better understand me, Dr. Thrift. The next few episodes are designed to lay the basic foundations needed for you to understand the direction of this show. Please subscribe to the show so you keep undated when new installments are released.